What you'll get as soon as you've downloaded it! macOS Sierra is now available to download as a free update. Go get it! It's supported on all Macs introduced since late 2009 and is available right now from the Mac App Store. As with previous OS X releases, the annual update introduces a few interesting new features without radically changing the entire OS, and that's the case here - but the new features Apple has demonstrated so far make it seem like a well worth upgrade. Here are ten things that make Sierra better than Windows. We knew it was coming thanks to references in official Apple documents: the OS X name is no more, and the Mac OS is back to being called macOS again - but this time without a capital letter, just like iOS, tvOS and watchOS. 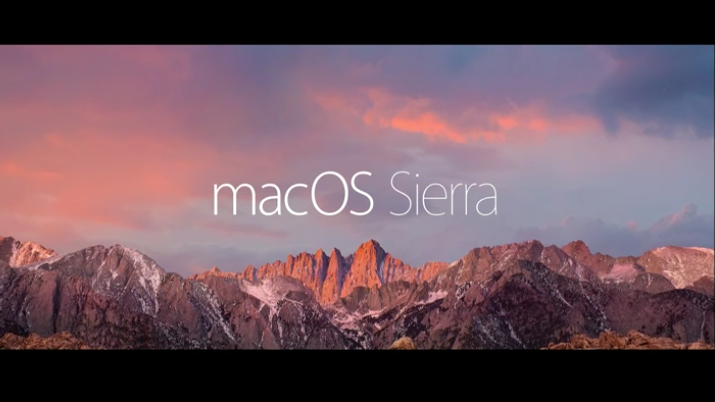 As an internal project it was codenamed Fuji, but the final release will be called macOS Sierra. This one's been on the wishlist for a while: automatic unlocking of your Mac. If like us you'd rather not have to type, retype and retype your password again when you open your MacBook, all you need is an Apple Watch. Your Mac will sense your Watch and when you open the lid (or tap a key, mouse or trackpad on the desktop) it'll log you in automatically. Windows 10 has this with Windows Hello, which doesn't require additional hardware, but we like the extra peace of mind that comes from requiring the Watch. Like Auto Unlock, the new Universal Clipboard uses Apple's Continuity to make macOS and iOS devices work together. This one's simple and really useful: if you copy something to the clipboard on your iPhone or iPad, you'll be able to paste it into something on your Mac - or vice-versa. It's not limited to text, either: you could scribble a drawing on an iPad and paste it into a document on your Mac. We're familiar with using iCloud Drive to store documents and access them from other devices, but in macOS Sierra iCloud gains some new powers: it can share not just the files you've stored, but your Mac desktop too. Files on your desktop will be available on any other Mac you sign into, and you'll be able to access them on iOS devices too. It's a little bit more elegant than sharing your Desktop folder via OneDrive. Apple wasn't finished with iCloud: in Sierra, it'll store old files - movies you've watched, ebooks you've read - in the cloud and make them available instantly, and it will also enable you to clear out the crud that infests every hard disk or SSD eventually. Apple's demo magically turned 20GB of disk space into 150GB, and while that's no doubt an extreme example anything that automatically sorts out extra space sounds good to us - even if it does remind us of the Windows Cleanup Wizard, which has been around since Windows XP. Craig Federighi's least painful joke - an image of someone trying to pay with a 27-inch iMac -introduced us to Apple Pay on the Mac. It adds a button to participating retailers' websites, and you'll be able to authorise the purchase by tapping on your Apple Watch or using TouchID on your iPhone. It's a little feature that could turn out to be a really big deal, and Microsoft doesn't have a rival to it. We're used to tabs in Safari and more recently in Finder, but with macOS Sierra tabs come to any app that would normally invoke multiple windows. Combining that with full-screen mode could be very useful, and the good news for developers is that the feature's baked into macOS - so they don't need to do anything to make their apps compatible. On Windows tabs are app-specific. This is something we've already seen on the iPad: the ability to shrink a video to a small rectangle so you can watch the football while getting some work done or arguing with people on the internet. With macOS Sierra, Picture in Picture comes to the desktop too. Microsoft is reportedly working on something similar for its Windows 10 Anniversary Update. Apple's digital personal assistant comes to the Mac, and we're really impressed by what we've seen so far: you'll be able to save Siri's search results in the Notification Center, which is great if you've asked her to find specific files you want to work on, and you'll be able to drag from Siri's results to a document - so you could get Siri to search for an image and drag the one you like best directly into a document. It isn't in the hardware yet, but TouchID made its way to the Mac in macOS Sierra: as we've already seen you can use TouchID on your phone to authenticate Apple Pay purchases, and you can use your Apple Watch or iPhone to automatically unlock your Mac. There's no reason why those devices can't be used to authenticate other things, such as third party apps. We're sure TouchID sensors are coming to the hardware, but this is a perfectly decent alternative in the meantime. Apple watchOS 3: it's far faster, has handwriting recognition, and easier app access. Has Apple nailed it this time?